England's grammar schools are "ghettos for the advantaged", doing little to alleviate poverty, an academic says. Research by Professor David Jesson from York University showed just 2% of pupils in grammars received free school meals, compared with 13% nationally. And in some grammars more than one third of pupils had come from fee-paying schools, he said. Another study said grammars benefited pupils from lower and higher income groups - but again, access was unequal. Academic papers reporting the findings were published in Research in Public Policy. Professor Jesson said: "Far from providing 'ladders of opportunity' for pupils from disadvantaged backgrounds, grammar schools are more like 'ghettos of the advantaged'. "Grammar schools do not offer a ladder of opportunity to any but a very small number of disadvantaged pupils. "In fact, their recruitment policies tend to favour pupils from more prosperous communities where eligibility for free school meals and other measures of deprivation are at very low levels. "Parents who can afford to send their children to private fee-paying schools have a distinct advantage in securing places at local grammar schools over pupils from state junior schools who are similarly able." 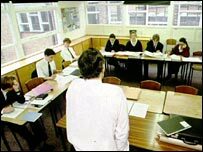 His analysis of the 164 grammar schools in England suggests that the 10 grammar schools with the highest level of recruitment of pupils from non-state schools took over one third of their pupils from these types of institutions. The next 10 took over a quarter of their pupils from this source while the next 10 enrolled more than a fifth. Research by Eric Maurin and Sandra McNally on grammar schools in Northern Ireland looked at the effect of widening access to more academically-oriented schooling. They concluded "that the effect of attending grammar school is similar for those from higher and lower income groups". An expansion of grammar school places was potentially beneficial to both groups - but access to grammar schools was very unequal, they said.